Ground turkey lightens up this traditional Middle Eastern dish without sacrificing flavor. Did you know that my family is Middle Eastern? I’m kidding. Garlic, lemon juice and olive oil runs through my veins. In fact, my Syrian heritage is the reason this blog is named The Lemon Bowl. One of my favorite Lebanese dishes is grilled kafta kabobs. Traditionally made with a lamb and beef combination, I decided to create a lighter version with ground turkey breast which we almost always have on hand. 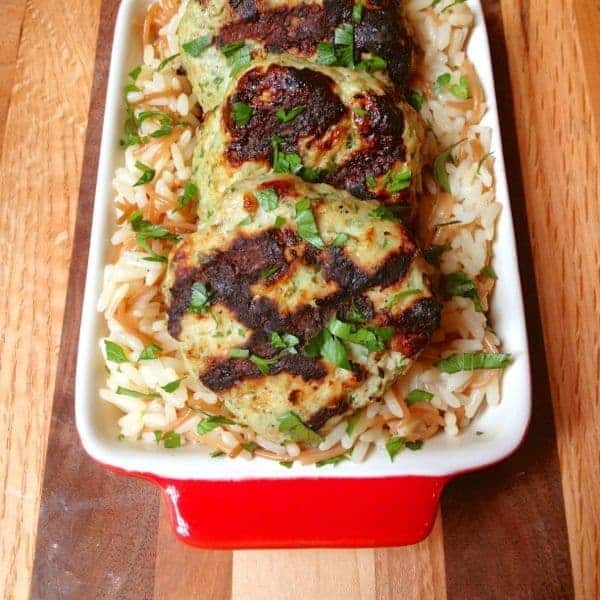 Thanks to the juicy onion and plenty of fresh parsley, these Grilled Turkey Kafta Patties came out tender, moist and delicious. Even my beef-loving husband admitted that I nailed it. Our 21 month old ate three patties so clearly they got his stamp of approval as well. 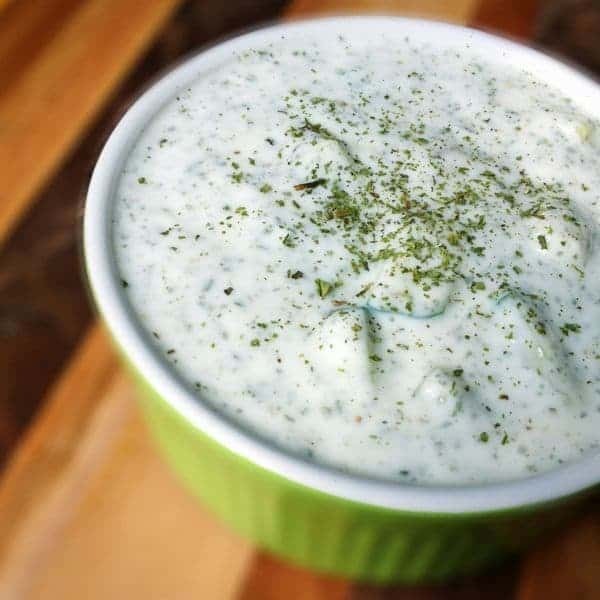 To serve, make a batch of Cucumber Laban – Lebanese Yogurt Sauce. Cool, creamy and tangy – it is the perfect balance to any grilled meat or seafood but works particularly well with kafta. A classic Middle Eastern Salad or Fattoush Salad would also be great with this dish. Don’t worry about too much garlic, two garlic breaths balance out the other so eat up and enjoy. BTW – This recipe (and entire suggested menu) is completely gluten free! Perfect for summer grilling season, especially when you may be hosting guests with various allergies. For more delicious gluten free recipe ideas and gluten free living support, head on over to the Udi’s Gluten Free Community. Pour olive oil on to a large plate; set aside. Pulse together all remaining ingredients (ground turkey through nutmeg) in a food processor until smooth, about 2-3 minutes. Remove blade from food processor and use hands to form 8 small patties. Place patties on plate with olive oil and toss once to coat both sides. Grill over high heat 3-4 minutes per side, turning once, until internal cooking temperature reaches 165 degrees or higher. 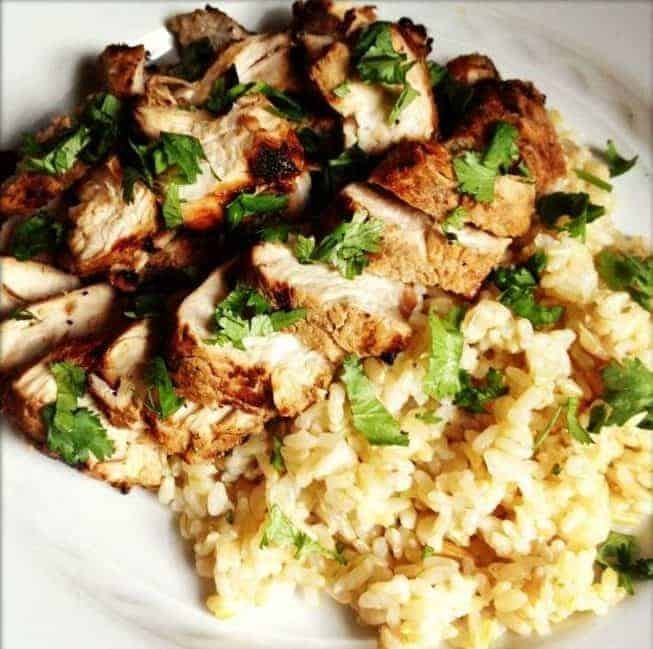 Garnish with fresh parsley and serve over rice pilaf or in a pita bread with cucumber yogurt sauce. 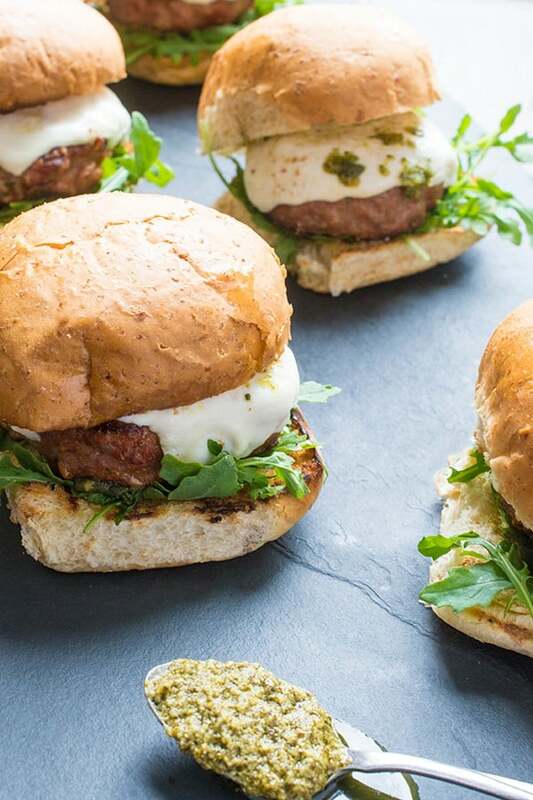 These patties can be cooked under the broiler just as easily as they can be grilled! Just broil on high for 4-5 minutes per side or until browned. 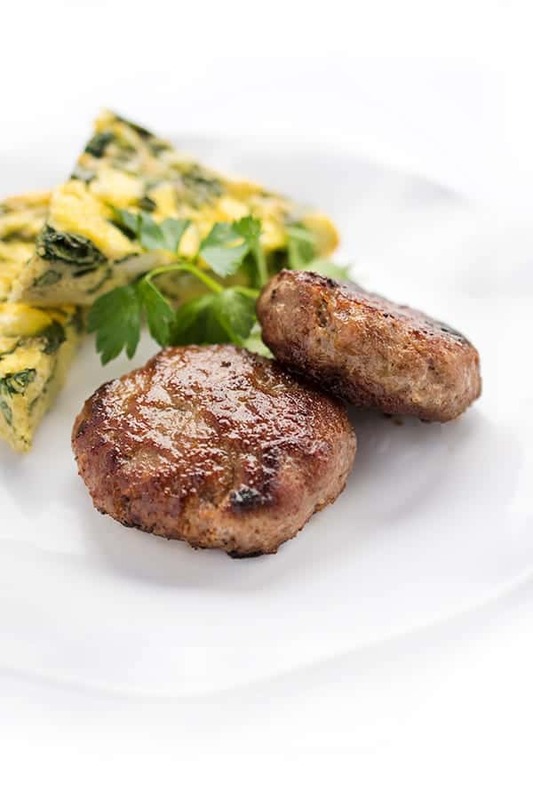 Also as you note, kafta is traditionally made with lamb and beef ~ and my Honey/Hubby LOVES the taste of LAMB (me too…) but I did find that while not as healthy /light as going with the straight ground turkey, doing a turkey/lamb combo gives the kafta the taste and texture Hubby craves ~ with an improved fat/nutrition profile. Thanks! I completely agree and also LOVE lamb!! I wish it was leaner!!! I hope you enjoy these! I made these tonight, with the Lebanese chickpea salad and the cucumber laban. Amazing!! Loved the flavors and the turkey patties, so moist and tasty.Will definitely do this again! Oh I’m so glad to hear it!!! This sounds yummy!! I don’t have a food processor but I do have a blender and a kitchen aid mixer…any suggestions? Thanks for the quick response! I am going to try it this week. I have really enjoyed your recipes. My husband is somewhat of a food snob so I find it difficult to find recipes that are fairly healthy and actually taste good. We use your shawarma recipe all the time now. Thanks again! Ooooh these look fantastic! And I’m sure my 21 month old would love them too! I didn’t realize you had a 21 month old!! Let me know if you try them! I love kafta! These look great and I love that you grill them! Wish we could eat and make it together!! With your mom’s yogurt! These look amazing! I am finding volunteer parsley plants popping up all over the place (where were they when I went out and bought 4 more to replace the ones the bunny nibbled?) so I’m delighted for a recipe using a cup of parsley, esp a meat recipe that my son can cook on the grill. Part of his summer enrichment program. Oh yes this is ideal for parsley in the garden this time of year!!! Thanks chica – you should try them sometime!!! So easy and healthy and good! Thanks Robyn!! Hope you had a great 4th! I love all of the flavors in these. Love it! That sauce and those patties…oh wow!!! Thanks Cathy – they are a huge hit in our house!! Such a nutritious and easy meal! Great recipe, Liz! Nutritious and easy is my middle name – haha!! Thanks Georgia!! This is the perfect meal! From top to bottom I’m in love with it! Thanks lady!!! Let me know if you try it! What a great recipe! I love middle eastern flavors in recipes. Me too…always reminds me of my relatives that are no longer with us. Love that about food! YES!! Please!!! :) That would be so fun! These sound yummy, but I have a question: any suggestions if the onion needs to be left out? My husband needs to avoid all members of the onion family. Hi Barbara: Onions are a key component to kafta so although I can give you suggestions for another recipe, it would not be anything to compare to traditional kafta. Perhaps you could make these patties more of an Italian style with parmesan cheese instead of onions? You could add sundried tomatoes too. Again, kafta really relies on the onion so I would probably just make something different. :-) I hope you understand!! I do understand completely and appreciate the thoughtful reply! I love your site by the way! Liz!!!!!!!!!! I so fist pumping excited about this recipe! Can I come over? Fist pump right back atcha!! Your seat is waiting. :) Wear a white dress. MMMm what a great menu! love it all! I’ve only tried beef kafta! Must try this turkey version!!! We adore beef kafta also but I thought it would be fun to try it with turkey and it worked!! This is the food I crave!! I want the entire meal. I’ve next tried kafta but I’ve seen it on menus. Me too!! I eat more Lebanese food when I’m pregnant than any other time! ohhhh, I love trying new things! These look awesome! You’d love them!! So lean but so full of flavor. My 22 month old ate three of them!